You're up against the wall with nowhere to turn�heart pounding, muscles tense, adrenaline pumping! There's no escape when you're listening to�Escape! Get set for twenty seat-of-your-pants excursions into the world of high adventure! Rudyard Kipling, H. G. Wells, Somerset Maugham, and more bring you stories of soldiers and spies, confusion and confessions, death and drama. 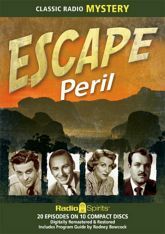 The voices of Vincent Price, Jack Webb, William Conrad, Alan Reed, John Dehner, and Virginia Gregg lead you to exotic travel, and terrible trouble, all over the globe. Includes a Program Guide by Rodney Bowcock.